Leor Zmigrod (University of Cambridge) looks at the cognitive underpinnings of nationalistic ideology in the context of Brexit. She writes that those with strongly nationalistic attitudes tend to process information in a more categorical way, and this relationship manifests itself through a tendency to support authoritarian and conservative ideologies. The failure of political polling in the recent elections of Europe and North America has revealed weaknesses in both our polling methodologies and our understanding of the psychological origins of voting behaviour. Traditional accounts tend to focus on the role of demographics and emotional influences in determining how citizens vote. Pollsters, politicians, and the public often fixate on how socioeconomic status, age, gender, race and geographical location shape voting preferences, or how charismatic leaders or emotionally-charged slogans motivate – and at times distort – voters’ preferences. Nonetheless, new empirical research conducted by myself and my colleagues at the University of Cambridge is revealing that non-emotional psychological dispositions also shape citizens’ ideological inclinations. That is, differences in the ways in which our brains process information may hold clues for why we vote in certain ways. The idea that our ideologies reflect our psychological motivations is not new. In an influential book titled The Authoritarian Personality (1950), Adorno and colleagues hypothesised that “ideologies have for different individuals, different degrees of appeal, a matter that depends upon the individual’s needs and the degree to which these needs are being satisfied or frustrated”. Similarly, in 1954, the famous psychologist Gordon Allport already suggested that our prejudices and ideological preferences are “unlikely to be merely specific attitude(s) toward specific group(s)… [these are] more likely to be a reflection of [a person’s] whole habit of thinking about the world”. These eloquent proposals captured the hearts and minds of researchers by making politics an extension of personal psychology, and not merely a feature of demographic circumstance. Even though these ideas have been around for nearly 70 years, there has been little rigorous empirical research examining how cognitive traits shape nationalism and voting behaviour. In a recent paper, we sought to investigate the extent to which individual differences in emotionally-neutral, “cold” information processing styles predict voting behaviour and nationalistic sentiments in the 2016 EU referendum. The findings reveal that individuals with strongly nationalistic attitudes tend to process information in a more categorical and persistent manner, even when tested on neutral cognitive tasks that are unrelated to their political beliefs. These cognitive tasks probed how flexibly individuals process and evaluate perceptual and linguistic information. Notably, while most research relies on often-biased self-report questionnaires to measure psychological traits, here objective cognitive measures were administered to quantify cognitive information processing tendencies in a rigorous manner. 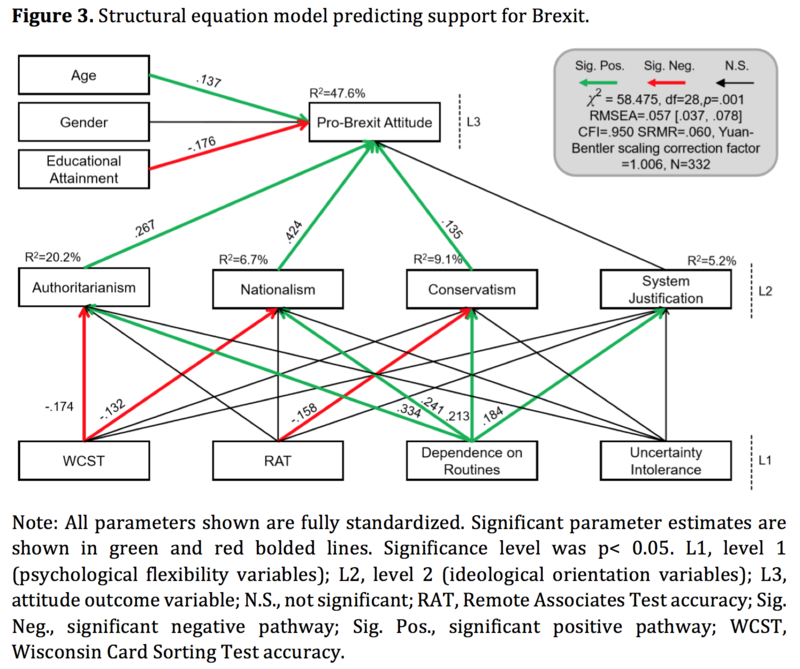 As evident in Figure 1, cognitive flexibility (measured by the Wisconsin Card Sorting Test) and support for Brexit were negatively correlated. In turn, cognitive flexibility was positively correlated with favourable attitudes towards immigration, the European Union, free movement of labour, and access to the EU Single Market (more details here). Additionally, cognitive flexibility was significantly negatively correlated with agreement with the idea that “a citizen of the world is a citizen of nowhere,” a quote by UK Prime Minister Theresa May (see Figure 2). This quote may be interpreted as reflecting a highly specific and narrow definition of citizenship, as well as some negativity toward globalization; the negative correlation might therefore indicate that psychological flexibility could be linked to how broadly versus narrowly identity boundaries are drawn. Furthermore, Structural Equation Modelling analysis demonstrated that cognitive flexibility and intolerance of ambiguity predicted individuals’ endorsement of authoritarianism, conservatism, and nationalism to a substantial degree (see Figure 3). Individuals who exhibited greater cognitive flexibility and were more tolerant of uncertainty were less likely to support authoritarian, conservative, and nationalistic attitudes. These ideological orientations in turn predicted participants’ attitudes towards Brexit, immigration, and free movement of labour, accounting for 47.6% of the variance in support for Brexit. The results suggest that cognitive thinking styles associated with processing perceptual and linguistic stimuli may also be drawn upon when individuals evaluate political and ideological arguments. Participants were also asked to indicate whether they believe that the UK Government has the right to remain in the EU if the costs of Brexit are too high. Cognitive flexibility was positively related to participants’ endorsement of the government’s right to adapt its policies to potential risks (see Figure 1). This highlights a parallel between flexible cognitive styles and support for flexible policy implementation. Notably, these psychological dispositions are not fixed or purely genetically determined. Education, training, and experience can shape individuals’ cognitive flexibility throughout the lifespan. We have already replicated these findings in other studies focused on different ideological domains. The results illustrate that non-emotional psychological dispositions can also predict religiosity, political partisanship (Zmigrod et al., under review), and intellectual humility (i.e. individuals’ receptivity to evidence in forming decisions; Zmigrod et al., under review). What are the implications of this research for British politics? Firstly, these findings challenge the idea that political behaviour is solely a product of emotional processes and demographic characteristics; our ideologies possess cognitive, non-emotional dimensions that transcend socioeconomic issues. Secondly, the results provide empirical evidence that – to some degree – democracy reflects a battle to capture and exploit our psychological biases and tendencies. Consequently, effective political campaigns may need to consider framing and providing policy solutions in terms that satisfy both individuals’ preferences for traditions and clarity as well as their desire for flexibility and change. 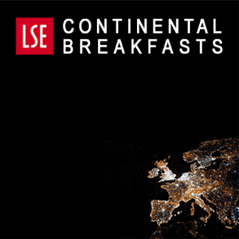 As a Brexit deal or no-deal scenario approaches in the coming months, policymakers may benefit from incorporating these considerations and implementing them in socially responsible ways. 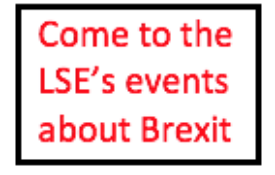 This post represents the views of the author and neither those of the LSE Brexit blog nor of the LSE. It first appeared on LSE British Politics and Policy. It draws on the author’s published work (with Peter J. Rentfrow, and Trevor W. Robbins) in Proceedings of the National Academy of Sciences. Featured image credit: Pixabay (Public Domain). Leor Zmigrod is a PhD candidate in the Department of Psychology at the University of Cambridge. I think people just want to look after their families and when Government sidelines whole communities like the fishing towns.EU membership has done nothing for them. I voted to Leave simply out of fury. I saw my grandmothers once proud northern seaside fishing town almost derelict.. The pretty street, where she once lived is very run down andI was told that most of the houses were now owned by a London landlord.and where people down on their luck from elsewhere were shoved.I did not read any of this on social media, I saw it for myself.We all know successive Governments have thought only about Financial Services . 80% is it? No wonder London is the only place thought about by those in power ,keen on taxes, while many parts of the country have been sidelined . So, you voted “out of fury”, did you. Don’t you think that voting is a seriously important element of democracy and that it should be very carefully considered, thought out and mature adult responsibility to yourself and others might be important? Prejudice and bias is to be fought and avoided at all costs. Selfishness is not a good fashion style if true compassion, empathy and patriotism is to be admired and promoted. The fishing industry is a very small, minor almost insignificant part of UK economy and therefore not a high priority for central government. The EU fights to insure FAIRNESS at all times. Being out of the EU means that we have no power at any table to fight for that same fairness that everyone wants and needs. Running away and turning our backs on the world as well as our neighbours will not make anything better and certainly not fair. Fish fo not belong to the UK or France or China or anything or anyone. Killing all the fish has only one result: No more fish. Who wants to eat fish or any seafood now anyway when they are full of microplastic which end up clogging our bodies and shortening our lives. The way to look after our families is to look after others. Doing to others as we would have others do to us is even more important for such a tiny island like ours is. The USA has been too big to fail until Trump put the boot in. We are reaping the whirlwind. The problems of our society are our local fault and responsibility alone. Scapegoating and blaming the EU is stupid irresponsibility writ LARGE. Remain and reform! I did consider and very hard , and against the rest of my family. How nasty and rude people like you are. How aloof and bigoted. The fishing industry may not be important to you, but it was once a very big part of the Uk economy and may very well be again.. Why do you think the French are so fussed about losing access to our waters! Why did Iceland not join the EU.! I think basing a whole economy on London Finance, partly propped up by property specu;ation is is a big mistake.and Brexit is where it got us. Why do you think much of the UK voted to Leave.apart from those in the cloisters of the University towns and London?. You cannot take away a mans way of life , his income and his home without some sort of anger.from him.As for the mad EU rules on fishing, go and ask a fisherman as I have done..British fishermen are fed up.The EU will never reform, Why should they when the unelected boffins are so convinced they are so right..and why David Cammeron felt it right to go to the people.when he failed to get any reform.from them. .
I’m sorry, Mrs. Cheek, I don’t understand your leave position. You voted to leave the EU because successive UK governments have neglected the fishing industry and the “once proud northern seaside fishing town” where your grandmother lived, and the EU did nothing to stop it? Was it protest vote against Cameron because he was for EU membership? The very good article here is about cognitive flexibility and how you can understand and ultimately predict individual voting patterns. It tells us something that analysis of voting patterns in the referendum have already shown us. In general, those whose minds have been trained in cognitive flexibility tend to support practical and flexible working solutions. The higher the educational attainment was the greatest indicator of a support for remaining in the EU. That doesn’t mean, of course, that it holds true in all cases. You may have a PhD and support leave, but generally the more educated and cognitively flexible people in our population overwhelmingly support remaining in the EU. David, What I am trying to say is that people voted the way they did for very personal reasons,no matter how clever or flexable their minds..I relate to the fishing town of my grandmother because it has suffered so much. One of the many reasons I voted Leave was because the people of Greece were given EU money they could never afford to pay back and did not see why they should as they so no personal benifit from that money. Greece was punished by the EU which caused the suffering of 40% unemployment.and a poverty only the beauty of the country could calm. I feel that the great EU idea has been debased . The EU has become a totalitarian state where no individual member’s problems are listened to no matter how serious they are. It is a state controlled by Germany and France.and a group of old unelected idealists. The EU idea should be about trade and not political power. . By David Cameron as far as I remember did try for a more bespoke UK relationship with the EU but got nowhere. I am very annoyed with this essay because it assumes people with little education voted Leave and the educated ones to Remain.What it says is that stupid people voted to leave and that clever ones remain To give the lady her due, she is, at least, not using laughable terms like inflexible cognition . It’s good to get empirical confirmation that I have very flexible cognition. It’s also comforting to know why people have Inflexible cognition and to know the causes of both. It’s further solid evidence for what is tragically wrong with education and parenting. It also provides evidence for the reasons and causes of both the genius brain and the “cognitively challenged” brain – the common garden variety so prevalent in sapiens.